You've found the “U.S. 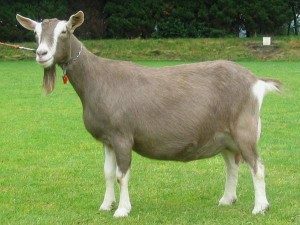 Toggenburg Goat Breeders” page here at Hobby Farm Wisdom! If this is the first time you have visited our site: Welcome! Nicknamed Togg, the Toggenburg goats are known for their exceptional milk production capability. A Togg doe holds a Guiness World Record for producing 9,110 lbs of milk. Many does keep producing milk even though it’s not breeding and are capable of producing over 5,000 lbs of milk per year. They are considered the oldest and purest of Swiss origin goats. They are medium/large sized with bucks standing 34-38 inches tall and weighing between 150-200 lbs. Does stand 30-32 inches and weight 125 lbs or more. Their basic colors can range between light fawn to dark chocolate but all display the same white ears with a dark spot in the middle, two white stripes down their faces, white legs, a white triangle on their tails. They have medium-length coats, upright ears and well-rounded udders. They do best in colder climates, are easy kidders, excellent mothers and foragers, and are also affectionate to humans.